Breaking the fourth wall throughout the story, Theodor Seuss Geisel Honor-winning author and illustrator Jonathan Fenske’s comic-like illustration style and clever, easy-to-read text make this hilarious book a must-have for every young reader’s shelf. Look at the book cover with your child. Have him predict what will happen in this book. Why did the squirrels stop loving nuts? What are some of the different ways they ate nuts? Can you think of other ways of eating nuts? 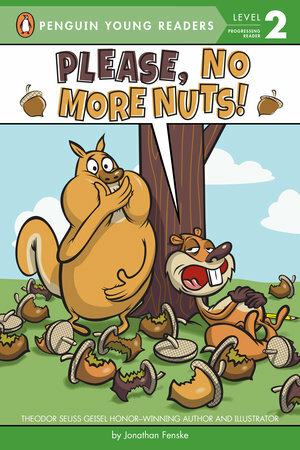 What are some of the things the squirrels say to try to convince you to take their nuts? Would you take their nuts? Why or why not? On the last page, why do the squirrels say “DON’T CLOSE THE BOOK!”? Have you ever eaten so much of something that you stopped liking it? It may not be immediately obvious to your child, but this book is written in verse. When reading aloud, have your child practice the rhythm of reading to make it sound more like poetry.